special forces, these battle-tested principles and techniques are available to you for the first time. Whether you are looking to raise your athletic skills to the next level, or simply seeking to increase your potential and to enjoy life, Systema Breathing is guaranteed to uncover the endless reserve of energy, health and happiness. This book presents step-by-step training drills given to you in a thorough and comprehensive way. You will learn the unique methodology of Systema breathing including the seven Systema breathing principles that provide the foundation for every physical activity of your daily life. Vladimir Vasiliev’s autograph and personal message can be requested at no extra charge! The second one, I was helping my son and his family move. I was unloading the last box on his moving van and walked off the back of the truck and missed the ramp. I fell over 5 feet onto pavement and landed with a forward roll. I was completely uninjured. I breathed out and relaxed without thinking and just softly rolled on the ground. (Bear in mind, I’m 48 years old and without Systema, I would have been badly injured.). Breathing is a warrior’s ally, an explorer’s companion and the gateway to many of life’s possibilities. Then there is Systema – one of the few surviving arts in existence today, that openly shares with people subtle principles about breathing. For many, this book will open up new areas of discovery. Based on experience I can testify that this has improved my health and the health of my patients that practice it. Everyone’s well being can be enhanced through this Systema Breathing treasure that modern Western medicine does not offer. Wow !!! I just want to thank Vladimir Vasiliev, Mikhail Ryabko, Kwan Lee, Scott Meredith for this exceptional Treasure. This Book gives us Hope and Answers the purpose of life……….. this is the Only guide you would need to heal yourself. Knowledge and wisdom from the masters open your eyes, without you we would be lost. If anyone has doubts, don’t, just buy it. I received my book last thursday. I have spent many years working with breathing exercises, to great frustration. The clarity and encouragement that this book delivers is just what is needed. No hokum or flowery explanations of what might be happening just how to do it in a realxed way and how to apply it. I am not so sure what I am going to do with the incence and other paraphenalia that is usually associated with breathing practices? I started employing the exercises that day and had one of those aha moments during my second day of work. The comment in the book that you don’t need to isolate yourself brought a great realisation to me. Do breathing while washing the dishes, do breathing while walking, driving the car, any and all of the time! The effectiveness of the burst breathing to get through the tough moments works better that anything I have ever tried. Then again why shouldn’t it? They teach it to women who are preparing for natural childbrith! A stress level I thankfully will never need to experience. All I can say is that we have been gifted once again by Vladimir. 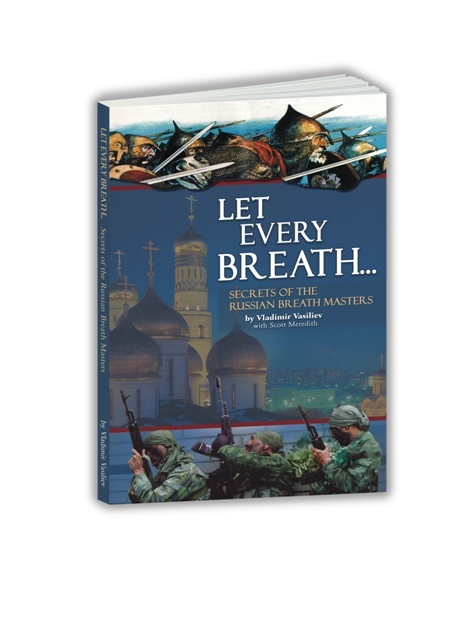 “Let Every Breath…” is a master piece. This book will change the way you do everything, and it will accelerate your understanding of Systema exponentially. It took me years to accumulate the knowledge and information that has been put into this book. For those of you who like to learn by following the ‘how to’ method, This book is for you. For those that were looking for a concise explanation of how, what, when, where and why to do it; This book is for you! For those that wanted to be given some guidance; This book is for you! For those that wanted an explanation of what they felt and understood but could not articulate it; This book is for you! This book is a monumental achievement. The body of work presented is the foundation of all work in Systema. There is a clear and comprehensive breakdown of the essential components of Systema Breathing and easy-to-follow instructions and diagrams for the related exercises. 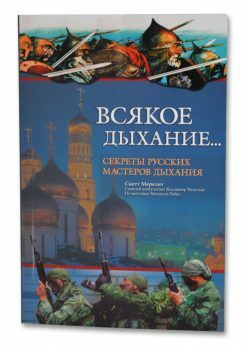 There are also clever antidotes delivered by Scott Meredith and guidance by Vladimir and Mikhail on how to live a better and more spiritual life. 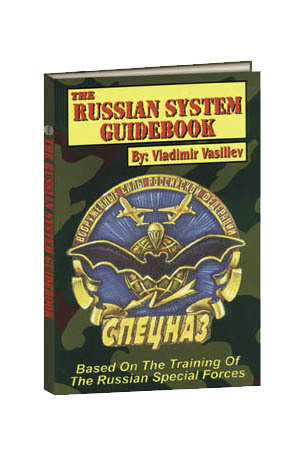 To the Systema beginner: Your training starts with this book. Everything else that is fancy and beautiful in Systema cannot be accomplished without a practical understanding of the book’s principles. This is the right foundation to build upon. To the regulars: All of the above plus… Once you read and apply this book (with patience), your understanding of the videos will be instantly enhanced, and your demeanor about training and outlook on life may change drastically as well, for the better. “Let Every Breath” is without a doubt a book which will change the lives of all who read it and practice its teachings. As a practitioner of kung fu and kempo karate, I saw from my first video purchase of Systema something unlike anything I had seen in my military training and studies of oriental martial arts. I’ve purchased many video’s and now this wonderful book. I could never put my entire heart and soul into my previous studies due to the philosophies and mysticism involved. Thank you Vladamir for bringing this amazing and exciting system founded in the Christian faith to the western world. I always thought that I knew the true meaning of this verse until I began to learn Systema. 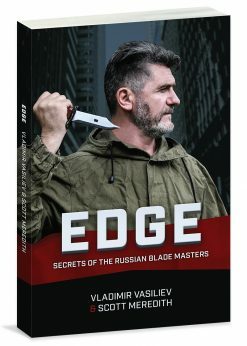 Even though I have not yet met Vladimir or Mikhail personally, I have still been sharpened by their teachings via video and reading materials. “Let Every Breath…” is another masterpiece that has served to shed more light on the unrefined and dull state of my “iron”. I am continually amazed as the concepts of this system reveal to me just how proud and weak I really am. The beauty of Systema though is that this continual realization is not an end, but a beginning. Because of this, I take great joy in facing the future, knowing that with the honesty, help and love of great friends like Vladimir and Mikhail, I can continue to be sharpened into a useful tool that will be of service to my God, my family, and my country. I bought this book at our school after class on Saturday. I finished reading it on Tuesday right before our next class. I knew the book would be helpful to my training, but I honestly did not even believe reading the book would make such a difference! But preconceptions do not matter; this book will help you even if you don’t expect it to. One particular way it helped me is with the “no breathing” confidence exercises we do in Systema class. After doing 20 pushups with different inhale/exhale patterns, I was always “out of breath,” a phrase to ponder, because how can I “run out” of something which is so plentiful and available? So I’d always struggle to do another 10 without breathing. And because I was “out of breath,” not breathing while exerting myself further caused me to panic, even though I knew that panicking was only using up oxygen faster. My instructor and fellow students offered much advice: don’t freak out, think of something else, look around the room, try not to dwell on lack of air. But it always ended up the same, I’d do two or three without breath, panic, and lay there panting while the rest of the class finished the set. It was only after reading Let Every Breath that I realized why this was happening and was able to correct my breathing so that I was not so winded. Of course, I still need lots of practice, particular with the leg lifts which are the hardest “no-breath” exercises for me. Sometimes I forget what was so crystal-clear immediately after finishing the book. But if I remember the principles described in Let Every Breath, I can get to 5 and occassionally or 7 or 10 without breath, which is a pretty dramatic improvement from just 2 or 3. As suggested, it’s very helpful to reach what I think is my maximum and try for just one more; in this way, my confidence improves gradually. I’m describing the “no-breath” exercises because they are the biggest challenge for me. Two things in particular helped me approach these in a different way. First, for the inhale/exhale sets, I shifted my focus from movement to breathing. Instead of matching my breathing to movement, I tried it the other way around. And that is how I became aware of movement that extended beyond my breathing. The book describes a natural pause between inhale and exhale. But with the exertion of movement, my pause was a bit longer than natural. Even though I began my inhale or exhale before the movement, as described, I was still halting it between inhale and exhale so that my movement could “catch up” with my breath. Again, these were very tiny pauses, barely noticeable, but they do add up! And that is why I was so often “out of breath” at the end of the sets. By shifting my focus to breathing, movement connects to breathing naturally, rather than artificially, and I’m less likely to force myself to move when there is no breath to support it. If you are wondering why is so important to me, it’s because I do consider it potentially life-saving knowledge. Recently I was watching a documentary program about accidents at sea and how people survive them. It’s an extremely difficult survival situation because of hypothermia, which causes people to make irrational decisions and even worse, to lose the will to live. At the end of the program, they interviewed a survival expert who trained people to prepare for disasters at sea. He was asked, “What can an average person do to increase their chances of survival when lost at sea?” And he said, “Know your own capabilities. Can you swim? How long can you hold your breath? These things will give you the confidence to know that you can make it through extreme circumstances.” Before reading Let Every Breath, if I had found myself in a situation where I could not breathe, I know for a fact that I would have panicked, felt despair, maybe even enough to give up! But now, I know that I can hold my breathe at least for a little while without panicking, it will certainly increase my chances of surviving such a situation. Another paragraph from the book which helped me quite a bit was the idea of breathing “through” the entire body during difficult conditioning exercises. I knew that it is helpful to visualize “breathing in” through the muscles that are under exertion, but the breath penetrates the entire body. Not just symbolically, it’s a biological fact that every cell needs oxygen. If the muscles are stiff, tight, sore, tense, or otherwise restricted, it’s harder to process the oxygen-rich blood and also to eliminate metabolic wastes. This is a difficult cycle; the tight muscles that would benefit most from increased blood flow actually get the least of it. Lack of oxygen and accumulation of wastes perpetuate and spread the problem to surrounding areas, and this can cause muscular pain as severe as joint and bone pain, and a lack of mobility so dramatic, many people resort to surgery. But I have to confess, I wasn’t entirely convinced that visualizing breathing through the entire body would actually bring increased oxygen to restricted areas. But it does seem to help, I’m not sure how or why, but I definitely feel less restriction to those areas when I envision breathing “through” the entire body. In fact, sometimes I’m not aware of the restriction until I visualize the breathing permeating my entire body. One thing I’d like to work on further is the concept of independence of breath, because I think that I have too closely tied pain management or exertion with exhaling. Focussing on the exhale is a little bit easier and I think most beginners are taught to start with that. But now that I’ve been training for a few years, I think it would be beneficial to look more closely at my breathing and its correlation to certain activities in training like accepting strikes, yielding to joint locks, falls and rolls, and even just exertion. Actually, there are many more ideas to ponder in Let Every Breath, and I’ve found it to be an inspiration. In my day-to-day life, I can gauge the effectiveness of my breathing by my commute to work each weekday morning. When I get out of the subway, I’m about as far underground as anyone can be in Manhattan, and there are two platforms above me. So I have to climb two flights of stairs and ascend a very steep ramp to get out to the street. If I’m stuck in a big crowd, this can be a slow process. And it actually makes me a bit sad to see people who look young and fit heaving themselves up the stairs as if it’s taking every last bit of energy to do so. Usually I take the stairs quickly, but if I’m sleepy or carrying heavy bags, it’s always harder than if I’m well-rested and empty-handed. If I’m out of breath when I reach the street, then I know I have forgotten some of those basic principles! This book is a treasure. You don’t have to be a martial artist or an athlete to benefit from reading it. If you breathe, it will help you! 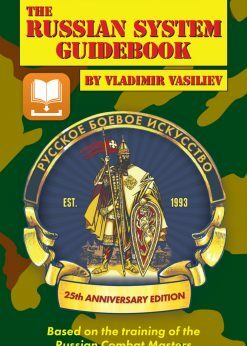 The principles of Russian breathing are so clearly described, with illustrations, exercises, and ideas to consider at every moment of the day. Just for starters: how often do you hold your breath? Holding the breath doesn’t necessarily mean you are puffed up and blue in the face. As the author explains, pay close attention to your breathing as you perform simple tasks: lift a heavy package, thread a needle, catch a ball. Is your breathing truly continous? It’s such a simple idea, and one that we take for granted: of course we don’t stop our breathing, or else we’d die. Even though I have been training in Russian Martial Art, after reading Let Every Breath, I realized that I stop my breathing at certain times, especially when I’m suprised: when the train lurches suddenly, when I accidentally drop something I’m carrying, or stumble, or knock something off my desk. These small pauses, barely noticeable until I thought to check for them, might seem inconsequential, but breath is life, and when it’s halted by fear or surprise or tension, it is contrary to our very survival, and it disconnects us from the natural harmony of the force of life. It’s subtle, but so important, if you think of how long most people can go without breathing, 10 or 20 seconds, perhaps a bit more, then it becomes apparent why even the smallest change in breathing will affect the whole body, and overall quality of life. And that’s why Let Every Breath is such an important book. It is not a book to change your lifestyle, get you to eat specific foods, follow any sort of schedule, or do anything by rote. The real gem of the book is simply the way it changes our perception of our own breathing, that which connects us to the greater universe around us. We look at a fish out of water, flopping around, and we know it is doomed. But somehow, we consider ourselves higher than those fish, as if they are imprisoned by their inability to survive without water. We even have an expression for those who are ill at ease: “like a fish out of water.” But we are no different! Fish need water, we need air, no creature can survive without the life-giving force of the universe, and the best way to appreciate any gift is to accept it with humble gratitude, and use it wisely and well. Where do you start with a Masterpiece? This is a must have book for all practitioners of Systema, Instructors and students alike and anyone from a sportsman to anyone with Breathing difficulties. Now just going for a walk is no excuse not to train…..in fact you can now quite literally train with every breath you take! 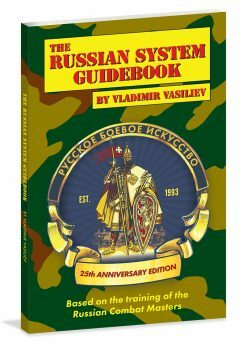 With continued breath work all derived from this book and the Russian Health System of Systema, I have been able to make a full recovery from dianosed “Central Cord Syndrome” (spinal injury), and reduce the nerve damage to a largely unnoticable sensation (continuing work in progress). This is truly a marvelous work and a wonder…I will reread the book and reread the book until the cover falls off, and I have to buy another copy straight from the author himself…. Systema is more than just martial art, it is a way of life. It enhances and preserves your life in many different ways going far beyond the physical confrontations we automatically think of. Recently I fell off while driving my Harley Davidson motorcycle, and I walked away without ANY injuries. I firmly believe my Systema training and breathing was a major contributor to my safe landing. My body knew automatically to be relaxed and roll when I hit the ground. Many of the drills Vladimir and Konstantin have shown me, including falls down the hill at last years summer camp were very benificial. It is truely remarkable what the body is capable of when you train it to relax in any difficult situation. I have really enjoyed reading this wonderful book “Let Every Breath…” These teachings have made an immense impact on my entire life, especially in the areas of scripture meditation and prayer. I have recently begun a study of Bible scriptures concerning the tie between spirit and breath. The many truths that I have stumbled upon in doing this have been mind staggering, and the joy that this has brought to me is wonderful. There are not any words in the English language that are able to describe my thanks to you for sharing this beautiful gift of Systema with the world. Please know that your wonderful sacrifices of time, sweat and tears do not go unnoticed. Two weeks ago I got a copy of “Let every breath”. At first glance, the ideas seem on contradictory to the systems of Indian an Chinese breathing techniques. But I decided to give it a try and it works very well. The benefit that I liked most, is that I can achieve a state of calmness and clearheadedness. It feels a little strange, letting the breath do the work e.g. pushups, squats and soon. Recently I finished reading your “Let Every Breath” book and immediately wanted to thank you. It is a deceptively simple book on Breath Work that has changed my outlook on not only training but on my philosophy as well. As a student of martial training for over 20 years, I was finding too much in the martial community that was more ego related than actual practical application. As I see more and more of Systema, I feel this was what I have been looking for. Thank you so much for your exceptionally effective training. Let Every Breath is truly a much-needed resource for every training library. 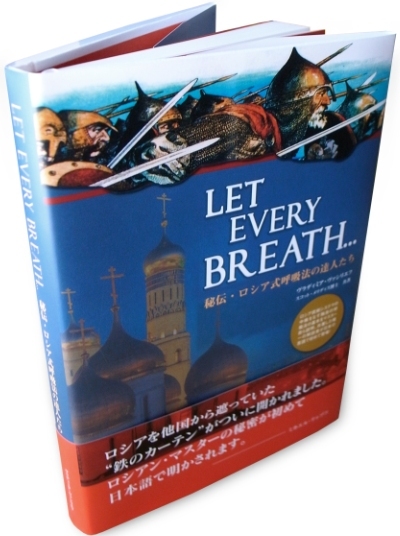 I purchased the “Let Every Breath…” book and lent it to my father who is a massage therapist. He liked it so much that he has been practicing the breathing ever since. 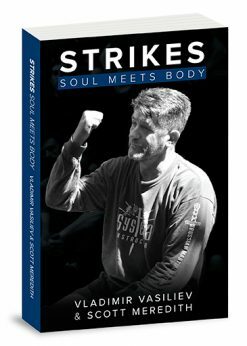 He has begun to apply Systema’s philosophy to his work and claims to have had some great results not only in his own increased energy levels/stamina but also in massage technique. I have learned to breathe to give awareness to my body and I have also learned to pray to give awareness to my soul. Thank you for sharing your knowledge, it has changed my life. I am a 35 year martial artist. I have a number of painful areas in my body which reduce movement. I have practiced several breathing and meditation regimens. Your breathing techniques have proven to be extremely simple and have helped me heal areas that I thought were never goingto get better. It is truly the most unique System I have ever seen, and believe me I’ve seen or tried just about every style commonly known and not commonly known. What I always looked to achieve is more efficiency in my training; stuff that works of course. 90% of the stuff taught in Martial Art schools is BS. I have been training for 16 years and have never seen such “effortlessness” as I have seen with these instructors. Breathing is something that even blackbelts do not seem to know these days. Today I received the book. I just want to say that my expectations are fulfilled. I am 56, a few days ago my horse spooked while we were galloping, he bucked, tossing me off. My horse continued on, I was alone in a fallowed field. 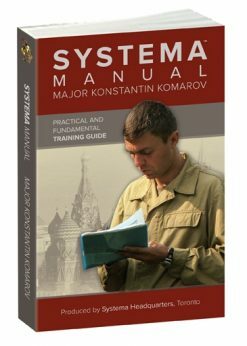 I dont know much about Systema, I had read 3/4 of the “Let Every Breath” book. I felt no panic, I took a hard hit, but I was peaceful and relaxed as practiced what I knew from your book. After a few minutes I was able to get up and walk home, practicing breathing. I was able to collect my horse, run him through some drills, re mount him and set things right between us. Remarkable to fall at galloping speed and not break any bones at my age. This book has become for me a support every day. Due to health problems, he gave me some hope, envy, trust in me and brought me back to faith, I too long repressed. This book gave me the keys to get my life back, and can start the real battle of a lifetime: Fighting my worst enemy, myself. I have just read the “Let Every Breath” book, and it is a beautifully written manual on the fundamental principles of breathing. I bought Let Every Breath last year and have read it many many times, it is definitely one of the most useful, practical books I have ever read. I also have read every article in the training tips section of your site and regularly check for new ones. Top notch! The element that is missing from all other martial art systems. In reading your book, I am coming to understand some thing that have been eluding me for years. Breath being prayer, breath being praise and breath as a restoration. Your art lines things up about healing and wholeness for me that I just wasn’t able to put together before. It occurs to me that the applications are limitless and I look forward to applying the principles to my daily life. I am writing to you to express my gratitude towards you for writing Let Every Breath. This is the first book about Systema I have ever read. But I still feel that there is something that is missing in my trainging – proper breathing technique. I then bought your book. When I began to practice for the first time, I performed push-ups with breathing techniques as described in your book. I was so surprised! I had the most relaxing push-ups in my life. Even after performing them, my body remained so relaxed. I can’t believe that a physical activity like pushup, which is supposed to create more tension in the body, causes me to be more relaxed even faster than perfoming some stretchings or Yoga. Or perhaps the training effect was so cleansing – that it heals the mental pain that I have held for a long time? It does not matter, though. I am just glad and happy. That’s why I am writing this message just to express my gratitude to you. – From what age is recommended to start teaching a child these exercises?, There are some care must be taken? I don’t believe that anyone who has searched for a real martial arts system could look past this book. Why? Because actually it is about so much more than “only” breathing air and oxygen. P.S. : I have a little Kuk Sool Won/Hapkido background, maybe that is the reason, why i fell so “much in love” with Systema. 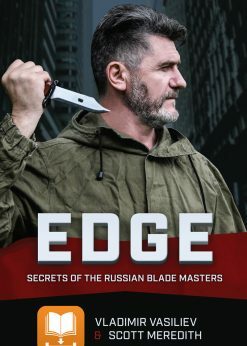 I came across Russian Martial Arts in 2010 through a Friend of mine who is Martial Arts enthusiast with 3 type of Martial arts technique training. He testified to me about Systema Breathing and he had 26 DVDs of which I have viewed all and as a jeet kune do lover I knew straing away I am seeing the best Martial Arts ever. He gave me the Let Every breath book and I study it and study and its like a Bible to me. I love it it has help me greatly in indeed as I struggle with my overweight problem. With understanding from Let Every breath even still with training I can master my condition enlarging my breathing capability daily to counter short breath. I am a Christian and new that zero state of Love is the ultimate in Christian and I was surprised that was the Systema Breathing ultimate Goal too…. there is no enemy, you love everyone, and you do not destroy an opponent you just overcome him. To me personally, the Book itself ” Let every Breath”contain enormous valuable knowledge that any person living ever need and I highly recommend it anyone who looking for something solid for it covers every aspect of our lives from normalcy to being atheletic in nature and age is not a limit. A student in my class had trouble sleeping and Vladimir’s recommendation has proved very helpful. In class last night, he shared that at night when he gets in bed, he now feels calm and relaxed; and it’s been easier to deal with negative emotions that have crept up in daily life. He’s seen definite improvement and is excited about continuing to make progress. I think I underestimated the power of breathing in Systema. Systema has shown me things I couldn’t imagine. I really underestimated it and cracked open the book “Let Every Breath” only yesterday. I wish I had begun reading it earlier. At work, I am often stressed and angry dealing with people. Work can sometimes be depressing or irritating. Sometimes infuriating. My mind wanders back to bad memories, such as my abusive childhood, bad relationships, betrayals I suffered and/or times in Iraq where I had to deal with much stress, unfairness and tragedy. Just by paying attention to my breathing, stopping and reminding myself, “Breath, Sean… stop and breathe”, I can calm myself, pray for guidance and help and get my mind on better things. I wish I knew that in Iraq. I wish I knew that in the Army. As a soldier, father, husband, man and Christian, Systema is teaching me a lot. God bless you, Vladimir, for helping so many of us to heal, strengthen and use our minds, body and spirit better. Over the years of learning Vladimir’s master work, I have been doing different exercises and drills that include certain patterns of breathing. Besides the fact that this is good for the development of certain attributes, I wasn’t able to figure out the whole picture. Yes, I felt I was more relaxed on the move or when under attack. I did feel I was becoming a better mover. However, it was not until this book that I saw the whole picture. This book painted it for me and for many of my friends. which I must say is one of the best books I’ve ever read and I often highly recommend to anyone complaining about everyday life stresses.